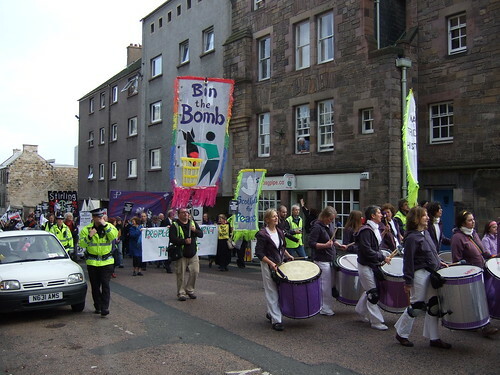 Bin The Bomb, originally uploaded by alister. Thousands marched through Edinburgh for the 'People and Parliament Against Trident' demo today. This is another issue where the SNP government of Scotland are picking a fight with Westminster, although the first minister Mr Salmond only sent a message of support. So far the strategy seems to be working quite well for him, with the Tories backing the idea of an English grand committee to solve the West Lothian Question (and if you don't know what that is, google it.). He has also adopted some key parts of the SSP programme in a watered down way - free prescription charges and free school meals. Another thing at this demo was the huge amount of police monitoring of protesters. Individual cops wielded digital cameras and video cameras were brazenly wielded. All this at a demo which was practically backed by the Scottish Government. Now that telephones are cameras, there is too many around.